Since the inception of its process design group in 1943, A.M. Kinney has acquired unsurpassed expertise in this discipline. Working on thousands of projects for a multitude of clients has equipped us with in-depth knowledge of the state-of the-art equipment and the processes used in numerous industries, especially in pharmaceutical, food, and specialty chemicals production. 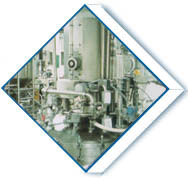 In particular, we are extremely well-versed in all unit operations involved in the feed systems, chemical reactions, and finished product handling involved with batch reactor systems. We have provided statistical process control for optimizing a variety of systems. In addition, we have had significant successes in scaling up pilot plant and semi-works facilities. Our reputation for design expertise is matched by the name we have made for ourselves with regard to ethics. The confidentiality of our clients' proprietary information is always of the utmost importance and highest priority.